I love Paris … and even more during FIAC. This year, in particular, the city of lights became the vibrant hub of the Art World with its incredible Museums and Galleries, its exhibitions and top-notch Art Fairs. A fair is the result of trial and error and the former (Off)icielle fair, FIAC’s “off fair”, which used to take place in the 13th was obviously unattractive. Instead FIAC not only has increased the number of its galleries but has extended to the Petit Palais, pedestrianising Avenue Winston Churchill between the two magnificent buildings. The Petit Palais is hosting the “On Site Sector” with a sculptures and installations exhibition: 40 works by 35 artists. A true jewel, its garden and galleries are the perfect settings for indoor and outdoor sculptures. I appreciated the conversations with the Ecole du Louvre students. They welcomed visitors and explained the artworks. Not Vittal sculptures presented by Thaddeus Ropac in Petit Palais’s garden were both pure and spectacular. I was truly impressed by how Asia Now has developed. The 2nd edition took place in a Hotel Particulier on Avenue Hoche, an elegant setting for the over 30 Asian galleries presenting works from emerging to more established galleries coming from 11 different countries. Paris-Beijing had a great video work by Wang Haiyang: “the purest hand drawing animation”. 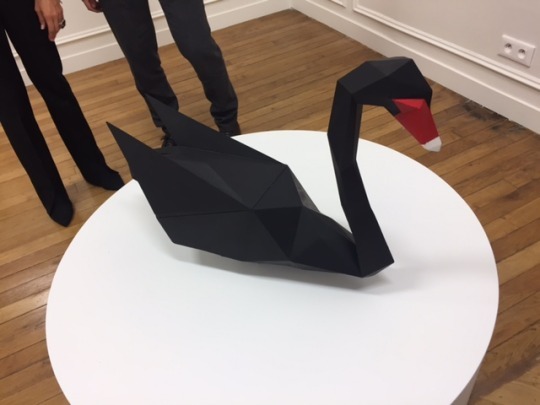 IFA Gallery was showing a playful installation/ sculpture/ photography: “Waterfowl” from the Chinese artist Xu Zhe: a Black swan as a poetic and humorous metaphor of Chinese society nowadays. Last but not least, I had an enchanting dinner with friends and artist Ma Desheng, one of the founders of the Star movement in China in 1979. Dining with this legend of Contemporary Chinese art in a Parisian bistro was surrealistic and reminded me that Paris still retains an incredible aura amongst artists and art lovers… I love Paris… indeed.